NOTE: At the bottom of this report are the GPS waypoints I picked off TOPO! and adjusted in the field. The web version of the report will have a PDF map attached which shows each route as a line with one or more labels (the map will explain the report and the waypoints http://www.climber.org/TripReports/) The road to the trailhead is very rough, but passable (with care) in my Honda CRX. See route "DIRT ROAD" in the waypoint file below. Pictures will also be available on the web version. PRELUDE: If you've never done a week-long trip with lots of different people and peaks and weather, it's a bit hard to explain how rich the texture of everything is. Being in the mountains re-connects me with my senses, especially when the crowds diminish and the weather comes in. I don't LIKE bad weather, but in an odd way I need it to fully experience the places I love. The last morning, for example, I awoke to the cool damp fresh air that can only follow a big storm. My real awakening, however, started when I separated the smell of lupine from everything else (lichens, rocks, pines, etc). I looked up and saw anew the purple carpet of 4" plants that had redoubled its efforts to attract pollinators. On the way to the pass I smelled for the first time each micro-zone: It was no longer just tundra, it was moss, brush, grass, and flowers, each making up a distinct part of a wonderful potpourri of smells. This olfactory experience continued on the east side of the pass, from 11500' down to 5500' through alpine, forest, and desert zones. I savored the heavy sweet alders, dusty pine duff, pungent sage, and a dozen other vibrant smells I can't identify. Without the rain, most of this would have gone unnoticed... Then at the car I washed off in a cold stream and let the dry desert breeze average out the sun and raindrops. I flipped on the radio and classical music wafted across the empty space until I drifted off to sleep. Everything is new and exciting again when you've not been bombarded with it for a week. The small world of food, water, sleep, climb, lets you see/feel/smell the subtle joys of the mountains, but it also lets you revel in "civilized" pleasures that would otherwise be mundane. Hopefully we'll meet in the mountains some day. Until then, do try to come back so you can enjoy all the things you left behind. This year's Climb-O-Rama was another week-long peakbagger event, but we had 3 or 4 permits and lots of people met for the first time. There was a San Diego block, a San Francisco block, and one guy we just bumped into who joined various parts of our group for two peaks. I'd like to thank everyone involved for sticking together when it was appropriate, and letting us know when they were peeling off. I had a great time, without sign-in sheets and formal rules. Anyway, we headed up Taboose Pass in small groups, intending to meet up at 10300' that night. Mark, Phil, and Jill got carried away and camped right at the pass, others of us had a relaxing afternoon sitting in the good campsites around a tarn (waypoint START9). It was amazingly windy, which we decided later was MUCH better than the mosquitoes which plagued us most of the trip. Next year we may do this later in the season after the buggers have died back a bit. Sunday some of us headed for Goodale (kitty litter with a really cool 3rd class summit block) and Striped (better rock, snow to come down) while others headed for Cardinal and still others just headed for our camp at Lake 3290 (about 10800') a mile downstream from Marjorie. The trail junction (Bench Lake vs. Upper Basin) is not obvious at all, and only about a third of us found it while walking down the west side of Taboose Pass. Some went down to South Fork and turned south on the Muir Trail, others came back up and bumped into my subgroup... so we got out the GPS and did a nice cross-country route over to the trail. I was pleased that everyone found the lake before dark, in spite of varying degrees of navigation skill and information about the trails. No one freaked out or went home, either! Tim and Bob were the last people to camp, having decided that Tim's Megamid tent was not a good summer tent in the wind and bugs... a bad case of equipment overconfidence, since it works just fine in a snow camping setting but can't be dug into rock and dirt. Tim did an heroic hike back to the car (from almost at the pass) to get a different tent while Bob bagged Goodale and Striped with us, then went back to camp to get Tim's big pack, then they finished a long day together and stumbled into camp looking like they'd need a day off. Monday most people headed to Pyramid on Monday, with Tim and Bob starting late and promising to catch up. (Right, sure, see ya!) Kalon headed to Pinchot, then signed out and went on his own adventure. We went past Bench Lake, around the corner, and wound up in one of the most beautiful valleys I've seen in the Sierra. A wonderful stream pounds and jumps down the center, with slabs and grass and good trees on both sides. The bugs liked it too. We came across great piles of what appeared to be mule dung about 10 minutes before we scared a couple of large cinnamon bears up the canyon wall. They run well uphill, fast enough that some of the group didn't even see them. Over another pass and into another great valley, we found a spot with a bit of wind to relax while scoping the route. Sidehilling hard, from PYRAM7, we stayed hundreds of feet above the valley floor, but chickened out on the 3rd class face next to a steep snow chute, choosing to traverse right into a 2nd class chute. Eddie signed out and headed for the face, making it up well before we did. (On the way down, we took a variation of his route and it works very well! Skip looking for an easy chute, and go instead for some broken ledges at the right end of the main face (waypoint PYRAM6). Tim and Bob caught us just as we were leaving the summit, and we waited for them so we could return together. We dropped a bit too low on the shoulder before Bench Lake on the way back, but still made camp before dark. Phil and Jill had hung around camp to fish, Gerhard and Carol Jean were relaxing and treating blisters, but we were all together again. Two long days in a row convinced Bob to sit out Wynne and Pinchot on Tuesday, which was a shame since none of the rest of us were sure about the traverse between them. The best direction is to go up past Marjorie but turn east where the trail crosses the highest stream (waypoint WYNNE3) instead of going all the way to Pinchot Pass (where we met some people who had climbed up from the valley to have breakfast away from the bugs). This will save some distance, and the footing is better. Get on the west ridge of Wynne, which is airy but class 2 near the bottom and loose class 2 near the top. 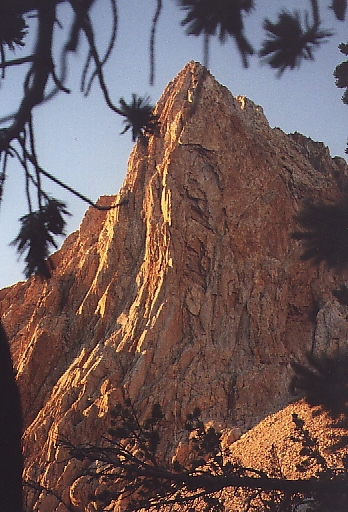 It's a great climb, following which you get a view of the nasty-looking traverse to Pinchot. If Bob had been with us, we might have done the high traverse. As it was, we couldn't tell if staying on the ridgeline (involving some really narrow airy catwalks and near vertical climbing) would lead to easier terrain or just to more gendarmes (as it appeared). The answer is "wind around the first gendarmes on easy ramps, then head sharply up ONE PITCH of 3rd or 4th class to easy slopes above what appear to be cliffs from the south". The top of that pitch leads you to the saddle, or you can do what we did: Stay low on the west side, going up and down steep loose ramps at the interface between the solid ridge rock and the more crumbly darker rock below. Only one ramp is 3rd class, but it's very loose and sharp plates. Ugh. From the top of Pinchot, we headed to the large chute(s) near the north end of the saddle, and south-southwest into the bowl south of the summit (waypoint WYNNE7). This is easy going, and you can see the entire chute from vantage points near the top. A quick dip in the lake at 3680m prepared me for the long walk back to camp, where we had to don head nets and goretex to keep the bugs at bay. This day had significant clouds, but no rain. Nice and cool! We were supposed to move camp to Upper Basin that afternoon, but no one was very enthused and several people wanted to hang around for Arrow the next day. Hours of discussion followed, with the mediated solution of dayhiking Ruskin the next day with some returning to our previous campsite and others continuing on to Upper Basin. Phil and Jill said goodbye and hiked out, their first backpack completed. Our revised plan worked great, and 10 of us eased up the classic airy 3rd class east ridge of Ruskin. We spent an hour on top, and two hours dozing and chatting at a tarn on the way down, then split into the Arrow and Prater parties (coincidentally southern and northern california participants). The east ridge requires a bit of nerve control, with two places requiring some exposed and/or vertical climbing but most of it being along the top of a very narrow ridge. The rock is mostly solid, but take a rope depending on your group (we had one but never got it out). There is a chute on the south face which leads you down without running the long third class ridge (see waypoint RUSK4) but it's loose. We had a competition between the two sides of the chute to see who knocked the most rocks, with the east siders losing 7:2. Carol got a bit below us and almost was hit with a heat-seeking rock that went around a corner, but otherwise the descent was great. Wednesday afternoon we headed into Upper Basin, camping beside a great stream with a sweeping view of the valley and even a granite bench we could all sit on. (The San Diego crowd did Arrow that day, then hiked out except for Mark who joined Rob on a side trip to Observation.) That night Rob stopped by our camp, and we invited him to climb Prater with us on Thursday. He did, then continued on to Split while we headed for our packs and Lake Basin. Once again, the definition of "class 2" gets stretched by Prater's summit ridge. It's all easy walking until you get within sight of the summit block and realize there is a 2' wide 6' long walk-across with nothing but air on both sides. Several people crawled across, but Bob (of course) strolled across with his hands in his pockets like he always does. Back in camp, enthusiasm for packing over to Lake Basin was waning quickly. Tim had a social engagement, Jim had a cold that was worsening (from a cough to chills), and Bob was catching a bad case of lethargy. Eddie and I split off when the three of them decided to hike out, and headed over Frozen Lake Pass toward Lake Basin. Both sides of the pass are great once you're a ways away, but each side has some boulders that make for slow going. Secor says class 2-3, but it's simple (if tedious) class 2. We made it across Lake basin to our intended campsite (lake 10632'), just before dark and just as the heavy clouds were breaking up, and waited for the temperature to drop so we could cook dinner in peace. No such luck, the bugs were out all night. I can still hear them when it's quiet. Friday dawned with clear skies, and Eddie and I were hiking by 6am. This was to be the longest day of the trip (6000' gain and 11 miles), and the weather had been looking worse each day, so we wanted to get as much done before noon as possible. We stayed high around the east shore of Marion Lake (scaring off a deer or two), and got onto granite slabs above the inlet waterfall (waypoint STATE2). From there we followed the drainage too far west and wound up climbing a very loose chute. Stay in the chute leading to the major saddle (waypoint STATE4) for better footing. There are good campsites as high as 11000' if you want to shorten the peak day. Marion is not too loose on the east and south sides, but the west side has lots of sandy chutes. We took the big one which starts about 150' down from the summit and drops due south, traversing hard west out of the chute around 11800' to the highest tarn (which doesn't show on the topo map). 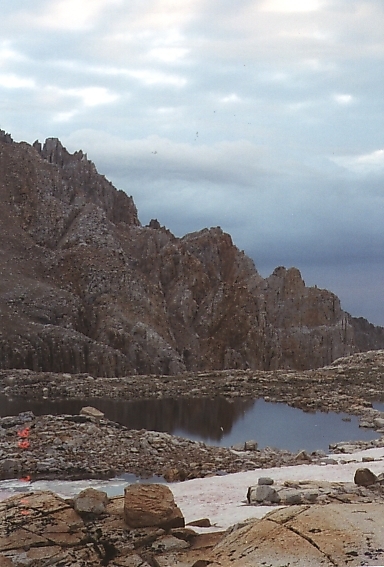 There is lots of water along the Cirque Crest, no need to carry more than a quart. Rather than run the crest, we went over ridges (waypoints STATE6, STATE7, STATE8) with minor drops on easy boulders into the valleys between. Don't drop too far, and make sure to take bearings on where you cross! The best ridge crossings are not obvious when going west-to-east. Each valley has great scenery and places to camp, suggesting perhaps a one-way traverse would be more fun than over-and-back in a day. Reversing our route was easy with the help of the GPS, which I don't normally use but which saved us a lot of time on this route. We only had two sprinkles (one hail, one shower) on the way. We made the mistake of trying to traverse around Marion (3rd class ridge, LONG sidehill, and only saved 600' of gain) but still it was a 13 hour day (same as Pyramid) and we had hours of daylight in camp. I huddled in my bivy bag to stay away from the bugs even though it was dry except one short shower after dark. Lots of lightning, very little thunder. I understand Mark and Rob did Observation from Upper Basin the same day, the subject of a separate trip report. Meanwhile, Bob, Jim, and Tim had climbed Cardinal and made their way out to Bob's truck on Friday. It had been making some bad noises, but Bob drove anyway since his was the most convenient vehicle. Oops. On the drive out a part of the front torsion bar sheared off a bolt (or two) and they came to an abrupt halt. Somehow they limped out to the paved road, and Carol gave them a lift to Bishop. It seems the San Diego crowd had also climbed Cardinal that day, but hiked out slower than the San Francisco crowd. In a stroke of good fortune, the first group out broke down. Bob's truck is still in Bishop as of this writing, where it was towed but could not be fixed until mid-week. They got home in a rental car, but spent an extra night in Bishop for their trouble of hiking out early. Secor is too hard on Cartridge Pass, calling it "a difficult cross country route". Not so. In fact, much of the Cartridge Pass trail is easier to walk on that some of the Taboose Pass trail. The part of the trail in Lake Basin is basically gone, stomped out of existence by deer and overgrown by the grass and bushes. You can pick up the trail on the east shore of the lakes just north of the pass, and follow well-constructed switchbacks up through talus until the upper portion of the cliffs (where rockslides have gradually buried it and it becomes a use trail that is steeper but visible). This part of the trip felt more like Alaska than the Sierra - the cloud floor was around 12500', clipping off the peaks and releasing a cold gray mist all morning. 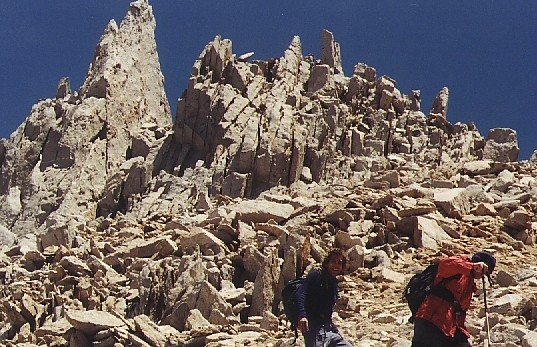 The trail on the north side of the pass stays well west of the cliffs mentioned in Secor's book, and after topping out it loops west and south of the highest lake on the south side. If you head straight for the lake south from the pass, you'll miss the best part of the trail (which was obviously intended for horses). The 7.5 topo maps show no outlet stream from lake 3300m, but there is a big one! The old trail gets faint here, but just stay on the east side of the stream and it will reappear. It switchbacks all the way down to the South Fork, steeper than most trails but clearly visible. Once down at the river, you wish you had traversed east sooner... there is a HUGE boulder field which is easily bypassed staying on the north side of the river but climbing up the slope until the alders give way to sagebrush (200' gain). Further upstream another boulder field is easier to cross, and a third one has a use trail right next to the stream. Rob tells us the old trail (on the south side) is impossible to use because of trees knocked across it by avalanches. Stay on the north side until you hit the Muir Trail, and you won't be sorry. It's a better route, even with full packs, and it avoids the dangerous stream crossings I've heard about when people try to follow the trail marked on the 15' topo maps. We picked my other bear can (trash cached near the Muir Trail) and headed up the hill toward Taboose Pass. The obvious trail at the top connects to an unobvious trail at the bottom, with no sign either place. We followed a compass bearing, and intersected a good trail somewhere around 10200'. In increasingly heavy mist and overcast skies, we hiked up to the highest trees west of the pass (good campsites at 3360m, south of the trail and stream) with just enough time to string my tarp between a couple of rocks before it started raining for real. It rained on an off from 4pm to 7pm, during which Eddie struggled with his tent (which he said looked like a train wreck) and I hunkered down waiting for sunset to remove the storm's energy source. A very exciting Saturday night, eh? Sure enough, we had a patch of blue sky just at dark, and no more rain overnight. Sunday morning we planned to get up early to catch a possible window in the weather. Eddie wasn't ready to leave when we were supposed to, so we decided not to stay together but to turn around if the weather was coming in. I got to the pass at 6:10am, loaded my day pack with all my clothes, and was on the summit of Cardinal at 7:15am. Holding 2000'/hour was my way of beating the rain storm I could see headed across the valley from the Inyos. I quickly read some very kind entries from others of our party who had climbed Cardinal on their way out, and headed down the closest big chute. It goes, but it's a real boot shredder with more golf balls and softballs than sand. (Eddie and I talked about whether to include this paragraph in the report, and it is his hope that others carefully consider the position he put me in when deciding NOT to turn around.) Eddie left the pass almost an hour after I did, and when I got back at the pass (8am) I could see him less than half way up the ridge with clouds swirling above and below him. It started to rain. Eddie pressed on, ignoring our agreement to turn around. It rained harder. Not wanting to risk lightning even at the saddle, I mentally wrote him off and hiked out alone. Mine was the only car at the (remote) trailhead, but another car arrived while I was waiting. My plan was to wait 4 hours and then drive out to call in the SAR folks. I'm glad he made it out alive, but failing to turn around could have lured me into a dangerous situation. The last thing I said when we split up was that I wouldn't come after him, and that he MUST turn around if the weather worsened: Eddie had no map, no compass, no altimeter, no watch, no GPS, in short no way of finding his way out in a storm. He never should have left the trail, and I suggested skipping the peak, but sometimes people want the peak so much they deny how dangerous it is. He reached the car 3.5 hours after I did, 30 minutes before I planned to drive away, in fine shape except for wet feet and some blisters. Luck? Perseverance? Safe? You decide. The real irony about the push to Cardinal is that Bob saw my sign-in from 12 years ago - I'd been there before, and had forgotten it entirely! It was a good workout, even though I didn't technically "need" it for my anticipated fall list finish. A high-calorie dinner at Whiskey Creek in Bishop and a boring drive home finished the week in the normal way. Again, thanks to everyone for making this a memorable week. I got all 10 peaks I was aiming for, others got out before the rain hit, no one was bored or injured. Gotta love that, eh?